Greenoaks Ltd offers an extensive range of small part storage solutions for every conceivable application. From raw materials, production line and assembly area storage to small part storage solutions for mobile service vehicles, we have a container system that is ideal for your purposes. Our shelving and container system for use with Athena Euro Containers is ideal where a variety of different parts of different sizes need to be stored line-side. The adjustable shelving unit is available in two sizes to accommodate 14 or 27 containers of different sizes. For very small parts, the Kanban system is ideal. A unit of sloped shelving to accommodate two rows of bins, one behind the other, allows for the empty bin to be removed and the full bin behind it to slope forwards ready for use. Contact us now and find the right Small Storage Solution for you! Our range of transit containers includes fibreboard, extruded plastic and high performance plywood based cases for total load protection. 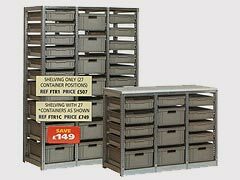 Stacking and nesting fibreboard containers can be manufactured to your own dimensions. Probably the most popular small parts storage solution, bin storage systems are versatile, robust and easy to use. A range of bins in different sizes and colours allows for easy identification of parts’ location. Bins can be ranged on free standing or mobile racks, wall mounted panels, lockable cupboards or turntable cabinets and retainer bars can be included as an option extra to hold bins in place when used in mobile service vehicles. For slightly larger items, stacking boxes are ideal. For general purpose choose from a range of sizes and colours of polypropylene boxes or Euro stacking containers; lightweight, sturdy and easy to clean, and perfect for use with pallets and roller or belt conveyor systems. For heavy duty use, galvanised steel boxes are available in two colours and five sizes. Practibox is a visible, dust-free, high density component storage system comprising transparent forward tilting boxes for easy access to stored items. Available in six modules of different sizes that clip together or fit into a bench dispenser or Practibox trolley dispenser this is an efficient store for a range of applications. Visible storage cabinets are also available in a wide range of sizes for use with turntable cabinets, free standing units and trolleys. These are ideal for industrial applications offering convenient and effective storage for thousands of small parts. Small Parts Storage Solutions. Call us on 0161 775 7178 or contact us below! If you think a small storage solution might solve you space problems, call us today on 0161 775 7178 or fill out the form below.